Coat salmon generously with the Spicy Sriracha Sauce. Press fillet into the panko to crust the top. In a pan, heat oil to medium, just before the smoke point. 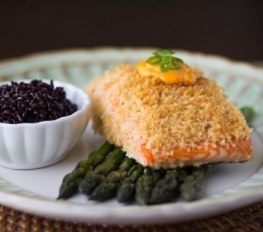 Place the fillet panko-side down and fry until golden brown. Turn over and sauté for another 4 to 5 minutes until done. Remove fillets from pan and place on a few paper towels to drain. Plate and garnish with a dollop of Spicy Sriracha Sauce and scallions, chives, or chopped parsley. Salt and pepper to taste. Bok Choy + Jasmine Rice. Broccoli + Wasabi Mashed Potatoes.